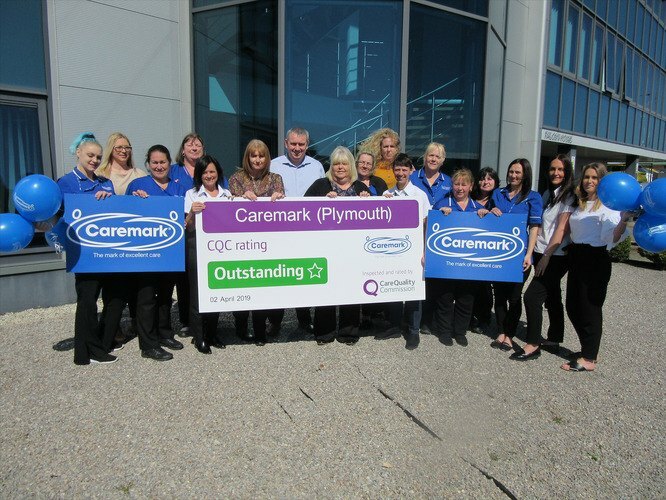 The team at Caremark (Plymouth) are celebrating after achieving an OUTSTANDING rating from the CQC. With only 2% of home care providers rated OUTSTANDING in England, this is testament to the exceptional care and support delivered by the Plymouth team to their clients. Owned and managed by Graham and Alison Livingston, Caremark (Plymouth) has received several awards in the past few years. The office has also been placed among the Top 20 Home Care Providers in the South West of England by a public vote in 2018. Graham and Alison have built a fantastic care team that embodies the values we stand for: compassion, professionalism and integrity. Care workers were commended for the exceptional work they do for the 200 local clients who receive their care. In particular, the CQC inspector acknowledged two specific cases of exceptional support. The first instance saw one care worker helping a client plan a funeral for a loved one, when there was no one else for the client to turn to. The second example was when a care worker fostered a client’s pet until they were well enough to resume caring for it on their own. Commenting on the ‘Outstanding’ rating, Graham said: “This result is a real testament to their dedication to providing a great quality of care to vulnerable people living in the area. I’d particularly like to thank my care manager, Karen, for all that she has done to continually go above and beyond to ensure our team feel supported. Nothing is ever too much trouble for her and her dedication to our clients is so admirable. I’m so pleased to celebrate with her, the office staff and our care workers.